Varicose veins are among the most persistent bugbears of standing workers – something that every treadmill desker becomes the moment the belt stops moving. Most readers will recognize the term, and many have probably heard it before in relation to prolonged standing; however, few will know the specifics of this health issue and, more importantly, how to deal with it. Fear not, but ignore not – varicose veins can be extremely unpleasant and will affect a surprisingly large percentage of workers. Fortunately, WorkWhileWalking has some basic tips on prevention and treatment. So to start, what are varicose veins? These engorged veins appear after internal one-way valves (most commonly in a sufferer’s calves) fail, which results in reverse blood flow and, eventually, weakened vein walls, hence the inflamed appearance of most varicose veins. Failing to address varicose veins can lead to an unsightly and sometimes painful place. If left untreated, they can pose a range of health risks, ranging from unpleasant to, well, very unpleasant. Standing, sadly, tends to make things worse, as it places more pressure on the circulatory system. 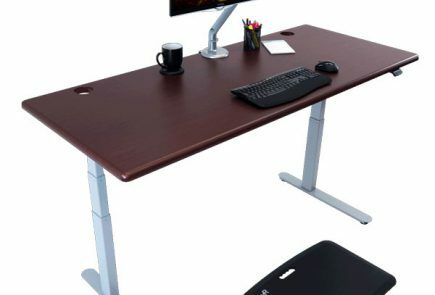 But don’t throw away your standing desk, for all the nastiness that varicose veins bring, there are steps every worker can take to keep them under control. Here are 5 choice bits of advice that any concerned stander can follow. Walking activates your calf muscles, which in turn squeezes veins in your legs, helping blood return to your heart. And veins need the help – unlike arteries, vein walls contain no muscle, so blood tends to pool in them unless you give it a push. Breaking up long periods of standing or sitting with a walk is always a great idea, and does wonders in preventing bad varicose veins. Adopting the use of an office treadmill, of course, is a great way to switch up from sitting or standing and staving off varicose vein development. Keeping in shape is essential for varicose vein control. Obesity can aggravate the condition and complicate treatment. Well-toned muscle also helps to keep blood moving, and discourages vein engorgement. Even incredibly simple exercises can help. Take time while standing to perform a set of calf raises – lift yourself up on tiptoe for a moment, then lower back down. Bringing a jump-rope to the office isn’t an option for everyone, but if you can, then go ahead and channel your inner 3rd grader. Skipping rope will cause rapid contraction of muscles in the calf, a major target zone for varicose vein worriers. Stay relaxed! Kick your feet up, figuratively and literally. A horizontal position places much stress on your cardiovascular system than sitting or standing. Orienting your calves vertically forces your blood flow to fight against gravity, so getting your legs up on a platform makes it much easier for blood to return through your veins. Leave the tight clothes at home. Waist-constricting garments are another vascular no-no as they bottleneck surface blood flow, making varicose veins even harder to avoid. And stay out of high heels if you can; that raised posture weakens calf muscles, leading to blood pooling and swollen veins. Elastic compression wear may seem like a strange step to take, but they work. The principle behind these superhero-esque garments is simple – they compress swollen veins, increasing the velocity of venous blood flow and preventing pooling. Standers with painfully swollen legs will also benefit – invest in a pair rated for over 20mmHg, they’ll make standing far more comfortable.